14th century (183-198 are 15th century). 198ff. 16 x 10 1/4 inches. 2 colums; 3-182 with a varying amount of text and about 80 lines of gloss, the remainder with 45-55 lines. 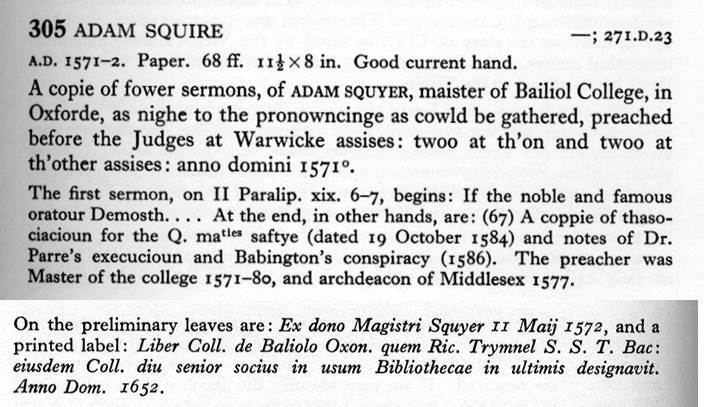 Collation: 2 leaves, i-xiii8 xiv-xv6 xvi2 | a-f8, no g, h8 o6 | i-ii8, the rest lost. Catchwords, and sometimes signatures. 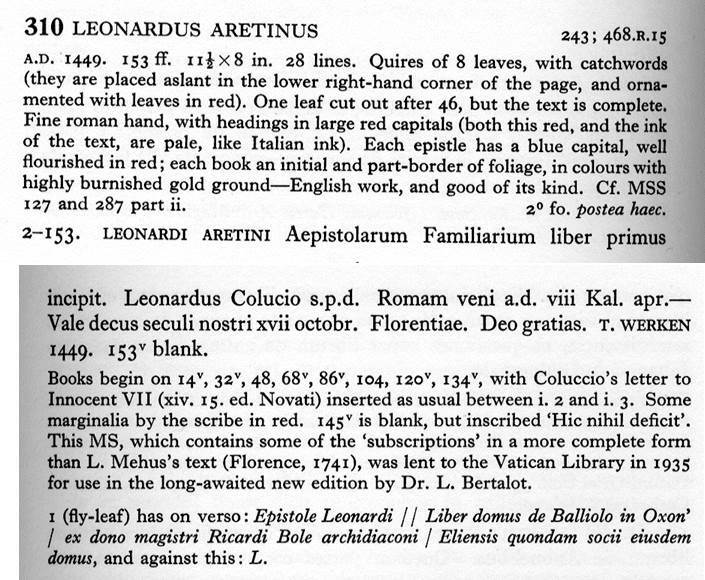 Several fairly good bookhands, in part using orange-brown ink, with red headings, and blue capitals flourished in red. Numerous small initials with part-borders (on 3 a full-page border) of fairly good work in gold and colour; 3 had a large initial (cf. 121), now removed with most of the text. 2o fo. (Text) suffragante; (Gloss) vel ita. 3-117v. 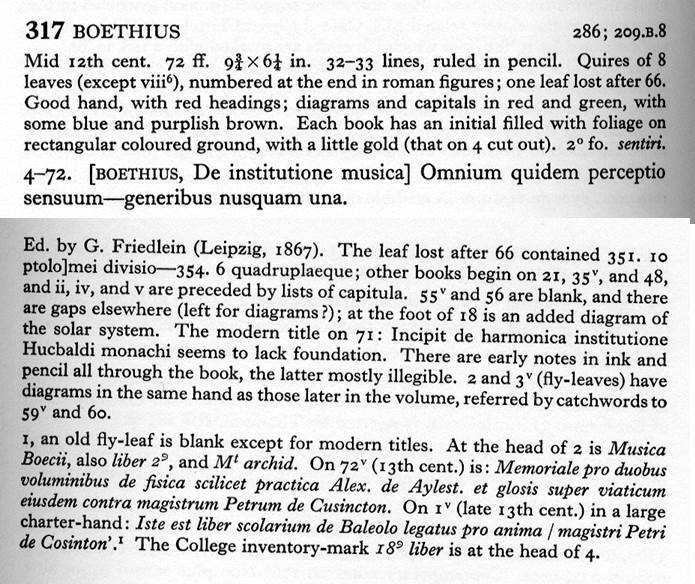 (I) [BONIFACIUS VIII, Liber Sextus Decretalium (beginning lost), with the gloss of Johannes monachus, beg.] In dei nomine amen. Secundum philosophum… rem per causam cognoscere… Ends (text): contra legis nititur voluntatem. 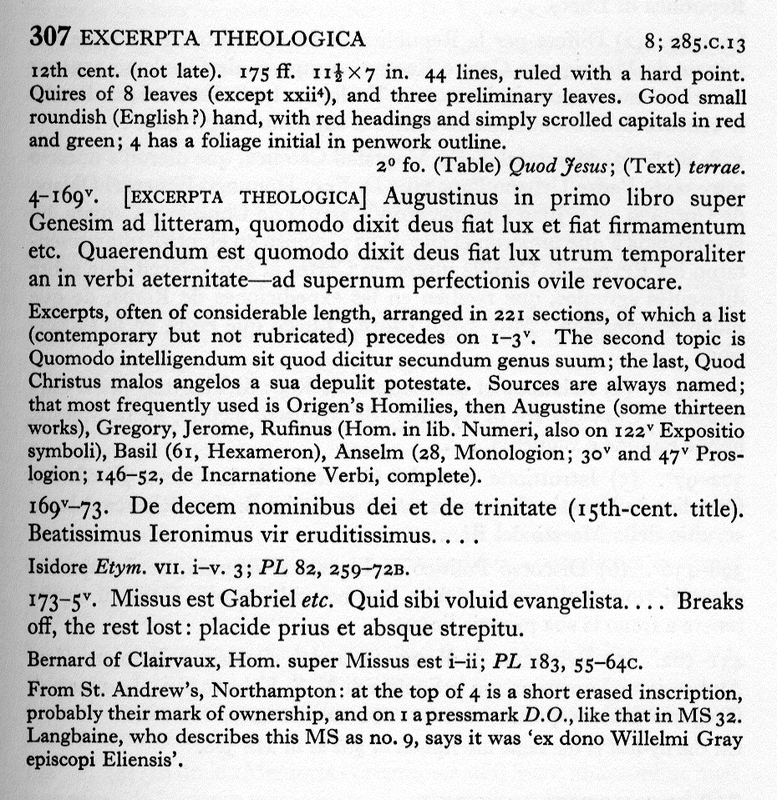 Explicit textus sexti etc. (gloss) : et xiiij w. iij plerique. 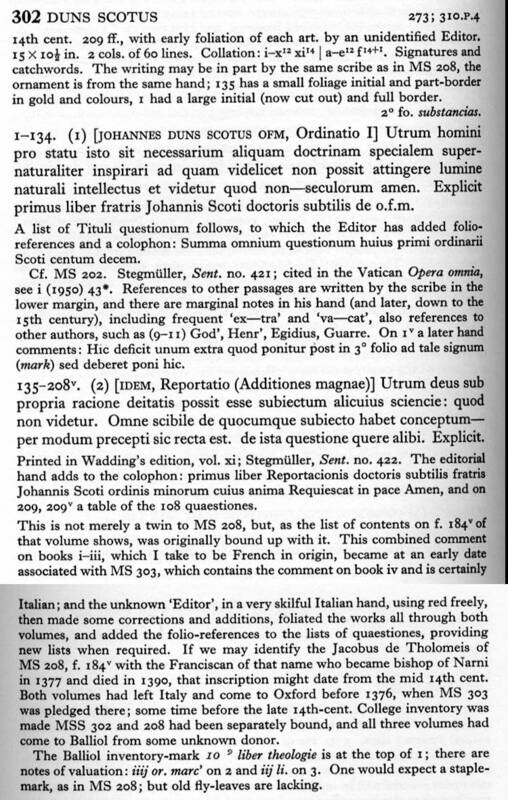 Explicit apparatus sexti libri decretalium per dominum Johannem Monachum compositus. On the following leaves, under the heading Nove constituciones, are added in a contemporary hand: (118) Extrav. Commun. V. x. 2 Provide attendentes, with gloss: Provide quod minus nomine suo pro suo interesse; (118v) Extrav. Joan. XXII i.2 Suscepti regiminis, surrounded (as though by a gloss) by iii Exsecrabilis. Then (119): Declaraciones super dicta constitucione. Circa constitucionem de pluralitate dignitatum personatuum – per attemptatcionem secundorum. Explicit etc. Amen; (119v) Two canons on the obligations of parishioners: Inprimis statuit et decrevit, ascribed to Wynchelce on visitation in Winchester diocese AD 1305, but here abbreviated, and: Ad doctrinam, ascribed to an unnamed archbishop of Canterbury on visitation – cf. 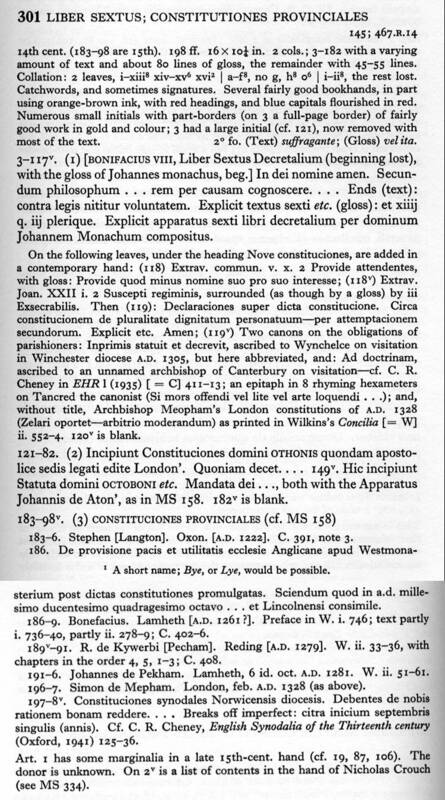 CR Cheney in EHR 1 (1935) [ = C] 411-413; an epitaph in 8 rhyming hexameters on Tancred the canonist (Si more offendi vel lite vel arte loquendi…); and, without title, Archbishop Meopham’s London constitutions of AD 1328 (Zelari oportet – arbitrio moderandum) as printed in Wilkins’ Concilia [=W] ii.552-554. 120v is blank. 121-182. 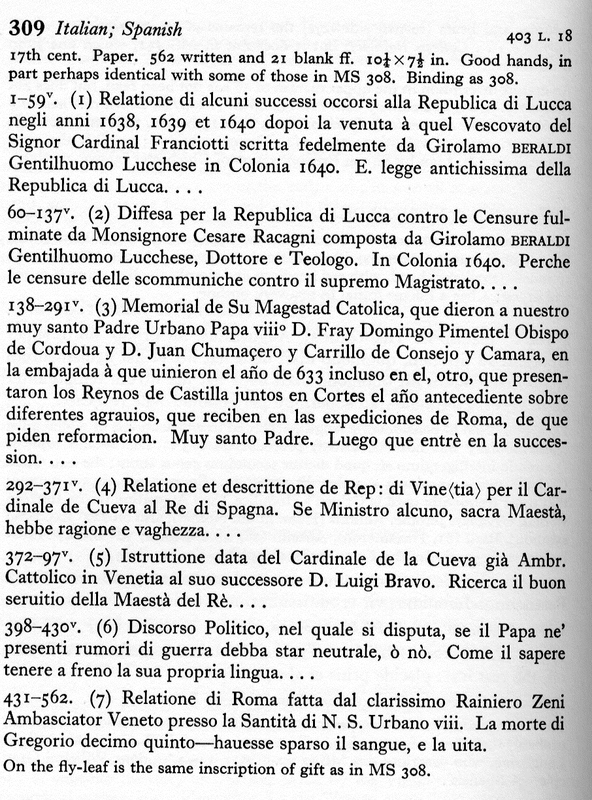 (2) Incipiunt Constituciones domini OTHONIS quondam apostolice sedis legati edite London’. 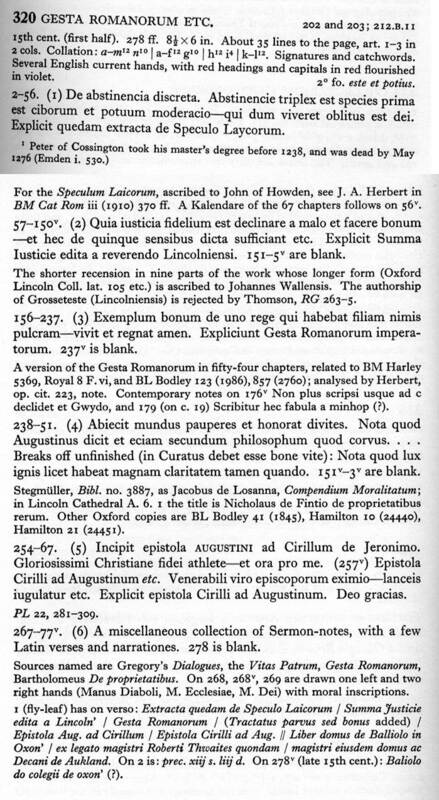 Quoniam decet… 149v. Hic incipient Statuta domini OCTOBONI etc. 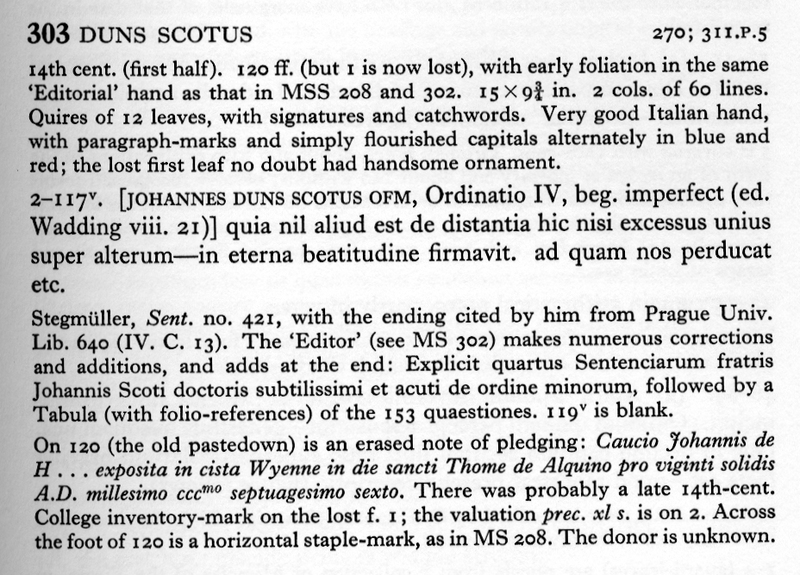 Mandata dei…, both with the Apparatus Johannis de Aton’, as in MS 158. 182v is blank. 183-186. Stephen [Langton]. Oxon. [AD 1222]. C. 391, note 3. 186. De provisione pacis et utilitatis ecclesie Anglicane apud Westmonasterium post dictas constitutions promulgates. Sciendum quod in a.d. millesimo ducentesimo quadragesimo octovao… et Lincolnensi consimile. 186-189. Bonefacius. Lamheth [sic] [AD 1261?]. 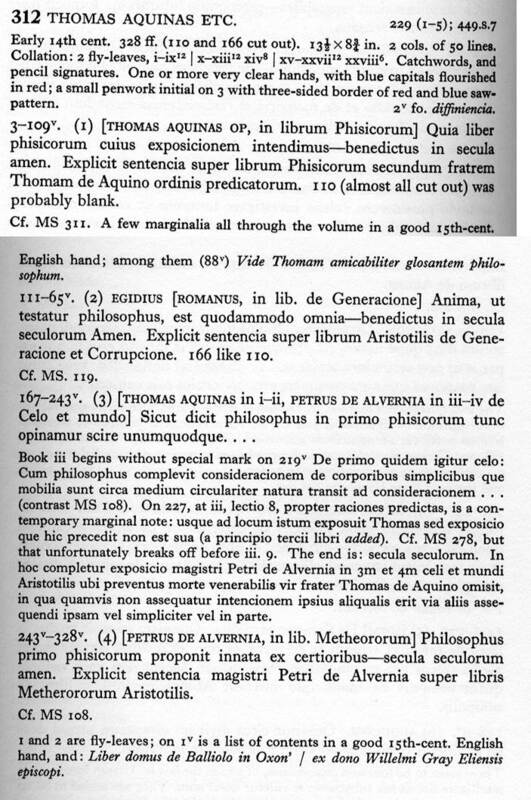 Preface in W.i.746; text partly i. 736-40, partly ii.278-8; C. 402-6. 189v-191. R. de Kywerbi [Pecham]. Reding [AD 1279]. W.ii.33-36, with chapters in the order 4, 5, 1-3; C.408. 191-196. Johannes de Pekham. Lamheth [sic] , 6 id. Oct. AD 1281. W.ii.51-61. 196-197. Simon de Mepham. London, feb. AD 1328 (as above). 197-198v. Constituciones synodales Norwicensis diocesis. Debentes de nobis rationem bonam redder… Breaks off imperfect: citra incinium septembris singulis (annis). CF. CFR Cheney, English Synodalia of the Thirteenth century (Oxford, 1941) 125-136. Art. I has some marginalia in a late 15th century hand (cf. 19, 87, 106). The donor is unknown . 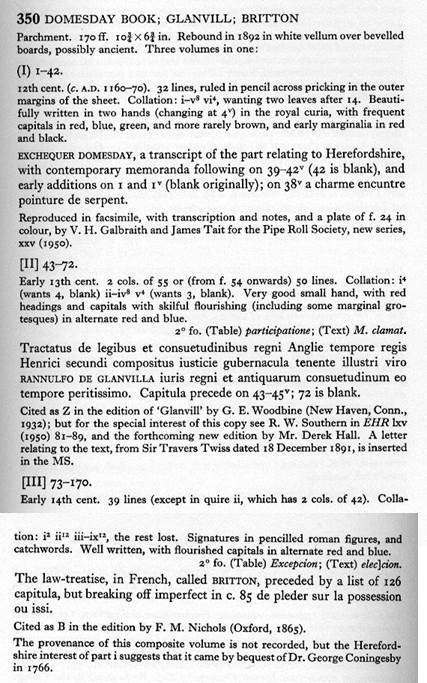 On 2v is a list of contents in the hand of Nicholas Crouch (see MS 334). 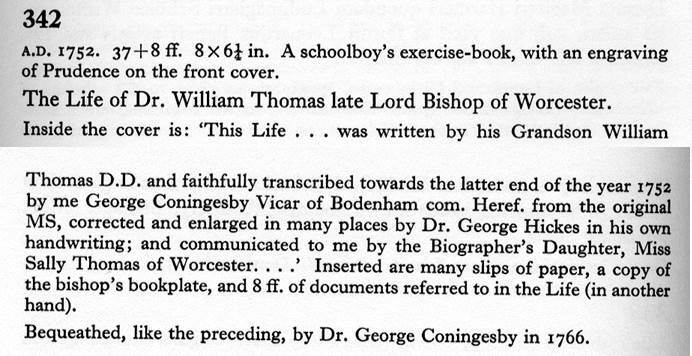 More about the MSS of Nicholas Crouch. Richter, Vladimir, SJ. "Zur Texttradition von Duns Scotus' Ordinatio. (A propos de la tradition textuelle de l'Ordinatio de Duns Scot)." Zeitschrift für Katholische Theologie Wien 103.4 (1981): 446-456. Cress, D. A. "Toward a Bibliography on Duns Scotus on the Existence of God." Franciscan Studies 35.1 (1976): 45-65.Project MUSE. Web. 18 Aug. 2016. <https://muse.jhu.edu/>. 304. This number is now void - formerly occupied by MS 173B. Thomson, Samuel Harrison. “A Note on the Works of Magister Adam de Bocfeld (Bochermefort),” Medievalia et Humanistica 2 , 56–87. Hennessy, MV. 'The Disappearing Book in The Revelation of the Hundred Pater Nosters.' Devotional Culture in Late Medieval England and Europe: Diverse Imaginations of Christ’s Life ed. by Stephen Kelly and Ryan Perry, Medieval Church Studies 31 (Turnhout: Brepols, 2014) pp. 243–266. Takala, Aapo. 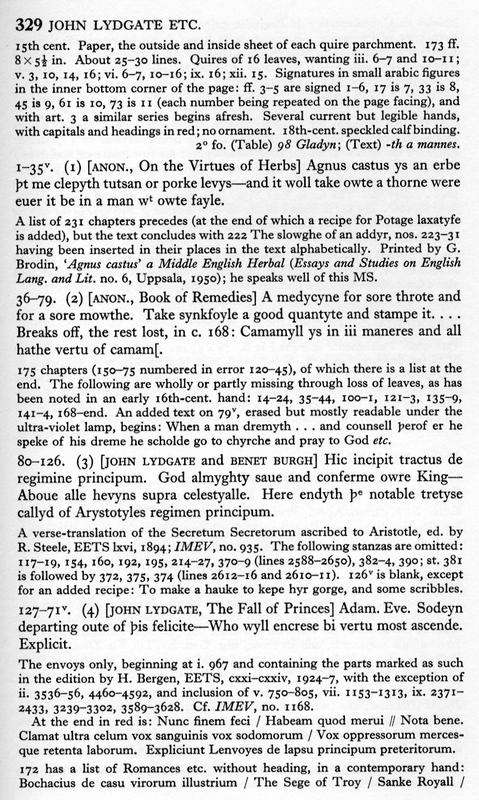 "A Curious Harpour in Helle: An Edition of the Commentary on the Orpheus Metre of De consolatione philosophiae in Manuscript Thott 304 2º. "Fund og Forskning i Det Kongelige Biblioteks Samlinger 50 (2015). 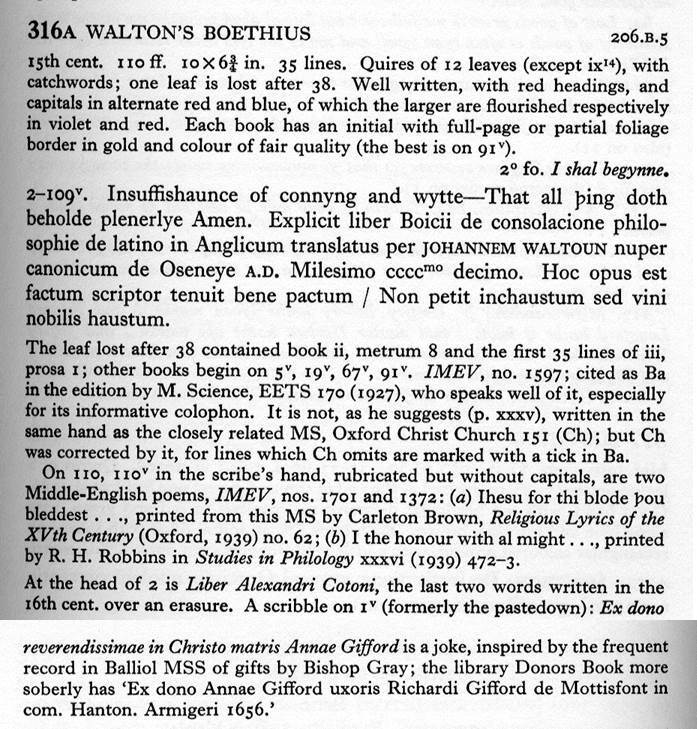 Edwards, A. S. G. "Reading John Walton’s Boethius in the Fifteenth and Sixteenth Centuries." Spaces for Reading in Later Medieval England. Palgrave Macmillan US, 2016. pp. 35-49. Robbins, Rossell Hope. 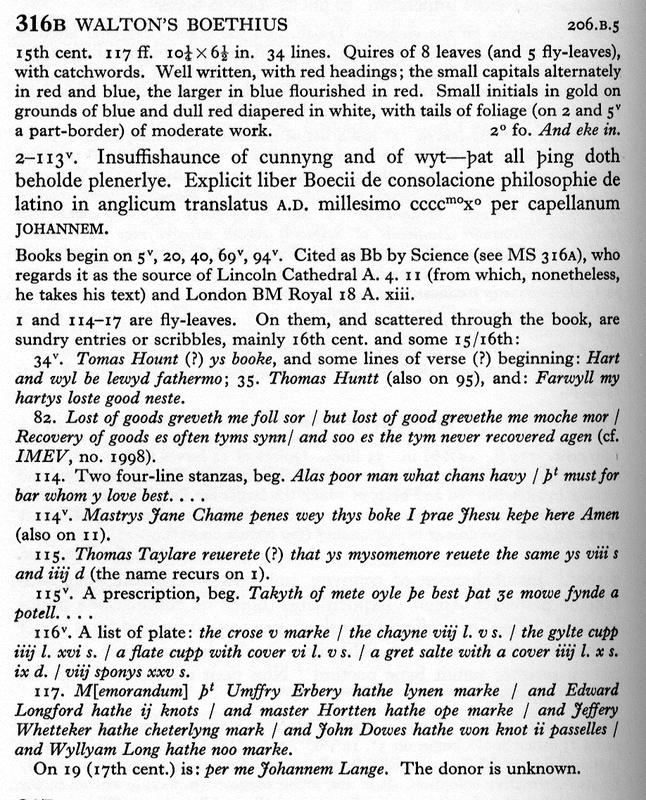 "Medical Manuscripts in Middle English." Speculum 45.03 (1970): 393-415. Mäkinen, Martti. 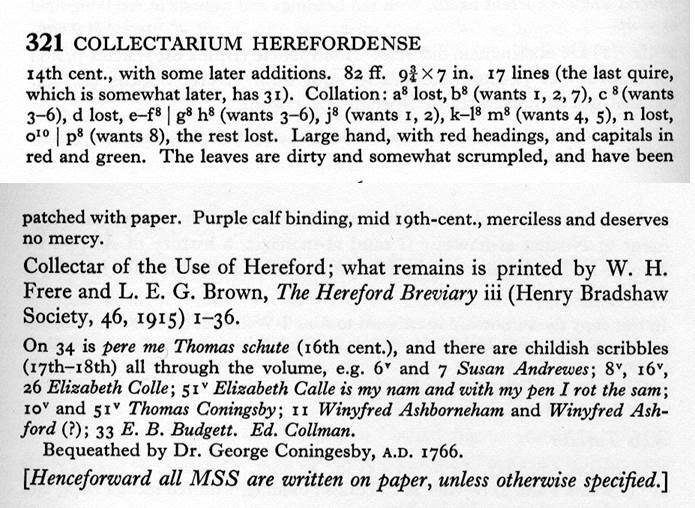 "Between Herbals et alia: Intertextuality in Medieval English Herbals." (2006). 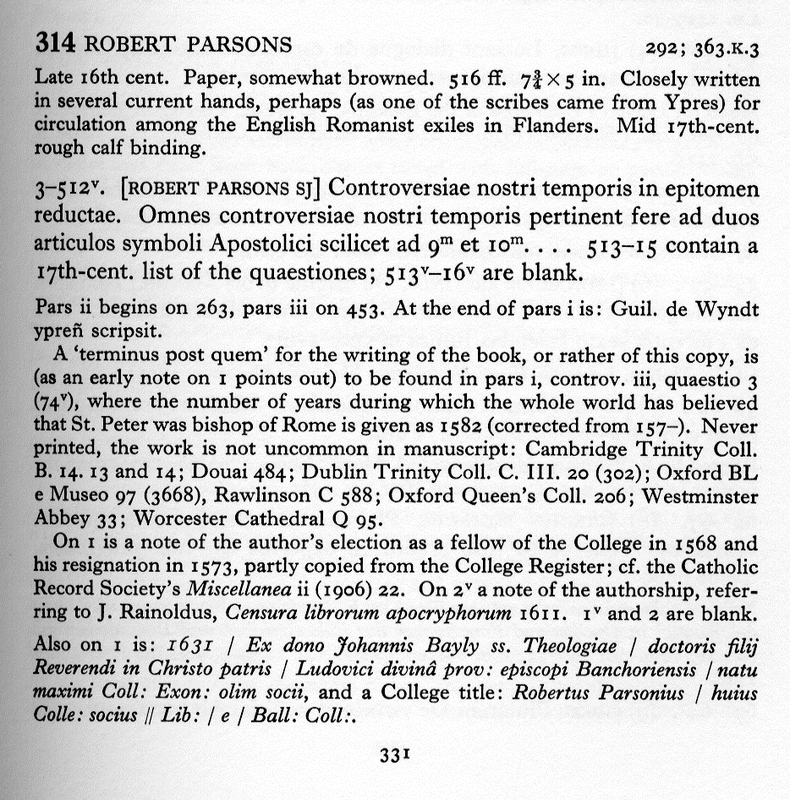 Mynors: About AD 1628-9. v + 44 ff. 8x6 in. Neatly written. Original vellum binding, formerly chained. The memorandum-Book of a country Justice under Charles I. 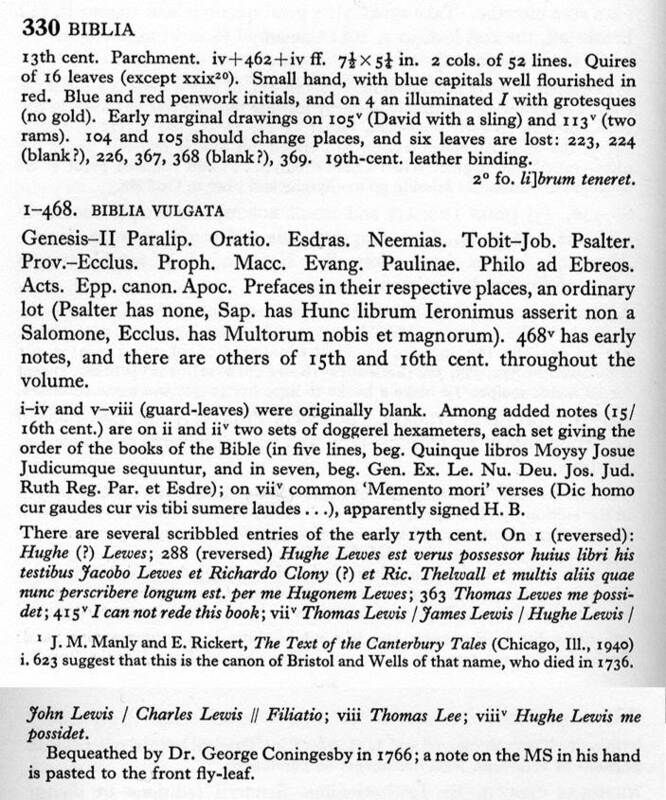 On i verso The Rates of Wages in Easter Sessions 1627; ii-v list of Felonies examinable or inquirable before Justice of Peace by Statutes; 1-21 table of offences and their penalties, with references to the authorities; 26-44 notes of Statutes and miscellanea. 22-25 and 38-40 are blank. Origin and donor unknown. 334. Nicholas Crouch MD (Fellow of the College 1640-1690), a notebook Pharmacopoeia compiled by him from printed sources (eg Sennert, and Ray's Catalogue of Plants), analysed first under drugs and then under complaints. (C 17) [condition: good] Images online More about Crouch's MSS. Coolahan, Marie-Louise. "'We Live by Chance, and Slip into Events': Occasionality and the Manuscript Verse of Katherine Philips." Eighteenth-Century Ireland/Iris an dá chultúr (2003): 9-23. Sant, Patricia M and James N Brown. 'Two Unpublished Poems by Katherine Philips (text)*.' English Literary Renaissance 24.1 (Dec 1994), pp 211-228. Tate, Rebecca Lynn. "Katherine Philips, a critical edition of the poetry." (1991). Galloway, Andrew. "The Rhetoric of Riddling in Late-Medieval England: The “Oxford” Riddles, the Secretum philosophorum, and the Riddles in Piers Plowman." Speculum 70.01 (1995): 68-105. Galbraith, Vivian Hunter, and James Tait, eds. Herefordshire Domesday: Circa 1160-1170; Reproduced... from... Balliol College Manuscript 350. Pipe Roll Society, 1950. Public Record Office. Domesday 1086-1986: an exhibition to celebrate the 900th anniversary of Domesday Book. London 1986.